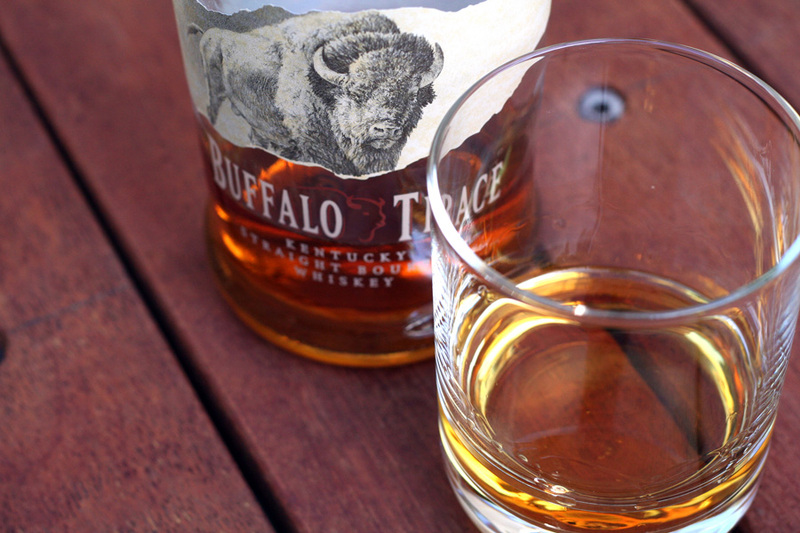 In my books this whisky, Buffalo Trace, is by far the best value bourbon you can by here in Australia. All the love and flavour of a single barrel bourbon while being at that all round attainable price. I first heard about Buffalo Trace through Whisky Cast a few of years back. Since then the release into Australia has been limited but now it can be found almost anywhere. At $49 AU in your local Dan Murphys I very much urge you to duck out and pick yourself up a bottle. Buffalo Trace has been making a name for themselves over the last few years not only because they have won the Distillery of the Year 7 times, or through a high quality product, but also through various experimentation methods which has (according to interviews on Whisky Cast) gotten them in a little bit trouble from time to time for breaking the rules of Bourbon. On the nose is deep sweet corns, the prickle of rye, vanilla and spice with a hint of coriander. All the things you would be expecting of a bourbon but then think of the depth found in a single barrel. To taste rich spices on the lips married with a mouth coating silky smooth sweet corns and vanilla oaks. The finish is medium to long and leaves a lengthy draw in the breath that re-invigorates the sweetness initially met in the pallet on every breath. Balance, as with most bourbons tends towards the corns but the spicy note is high giving a great balance across the pallet that just leaves you wanting a sip more each time. You seriously are not expecting so much out of only 40% alcohol. Very complex indeed. Great for a balmy summers afternoon. If I was to give a dram 6 1/4 out of 7. To be enjoy with extreme prejudice. It will always have a place on my shelf for this baby. Of note we were recently at a Kilchoman masterclass and it was made aware that they exclusively source their barrels from Buffalo Trace. Kilchoman is the youngest of all the Islay Distilleries being founded in 2005. Also be warned with this one the exciting tips and tails do tend to diminish quite quickly after the bottle is opened so try and down this bottle in a couple of weeks and no more than 2 months. I suspect the low alcohol contributes to this issue.